One of the biggest contributors to personal bankruptcy in America is health-care debt. This can be created in a number of ways: an accident, such as breaking your arm; as people get older their bodies begin to shutdown; people can be born with conditions requiring constant medical care; and in many cases people choose to use medical services such as in the case of an intentional pregnancy. My wife and I recently had our second child. Considering the expenses involved in child-birth, we would be on the hook for the equivalent of a new mid-sized sedan had we not had health insurance. The reasons medical services have gotten so expensive have been analyzed by various economists. 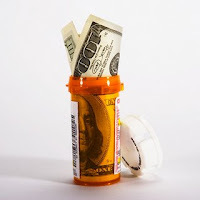 According to Milton Friedman, "The high cost and inequitable character of our medical care system are the direct result of our steady movement toward reliance on third-party payment." These third-party payers include insurance companies and governments. So involved is government in health-care, that Friedman characterizes the American health-care industry as half-way to "completely socialized medicine." And as anyone who understands Socialism knows, it's a political system founded on the principle of the equal distribution of wealth. It is obvious to me, because I understand this, as well as the concept of "insurance," that the goal of health-care reform is the re-distribution of wealth. As mortal beings unable to see the future, our lives are filled with uncertainty. Risk is defined as "exposure to the chance of injury or loss." Since no one spends their lives in a sealed bubble, completely safe from injury or loss, we all encounter risk. We don't know what injuries or losses we may suffer, so we purchase insurance. An insurance policy is a contract with others that guarantees a covered injury or loss will be indemnified. It requires everyone to contribute a certain amount of money each, called a "premium," to an insurance pool. When a policy owner suffers an injury or loss, funds necessary for indemnification are withdrawn from the pool. This is how risk is transferred to others. The insurance market has created several types of coverage. There is insurance for risks associated with owning and driving an automobile, owning a home, and dying, among others. The root of the concept of insurance is uncertainty about the future, when there is risk. When someone experiences an unforeseen injury or loss, their insurance protects them from the resulting burden. Most health insurance policies sold today include payments for things that cannot be characterized as risk, the exposure to the chance of injury or loss. Health insurance coverage includes foreseen things like annual checkups and, as I recently experienced, planned pregnancy. This can hardly be defined as insurance. It is more closely related to some type of discount card or club membership benefit. And, as Friedman explained in his article, health-insurance coverage is the equivalent of payments to cut your lawn or change the oil in your car. He also explains why the health-insurance market has evolved this way, that "the states and the federal government have increasingly specified the coverage of insurance for medical care to a detail not common in other areas." I recommend his article for a full explanation of that. What Is The Aim of Health-Care Reform? This brings us to the current attempt in the United States to reform the health-care industry. The goal of reform was explained by President Obama, "It will provide more security and stability to those who have health insurance. It will provide insurance to those who don’t. And it will lower the cost of health care for our families, our businesses, and our government." The various ways promoted by President Obama to accomplish this include: requiring, by law, that everyone purchase health insurance or pay a fine (the homeless too? ), provide taxpayer-funded insurance called the "public option," and by making it illegal for health insurance companies to deny coverage based on pre-existing conditions. This is the general scope of health-care reform. Why Is It About The Re-distribution of Wealth? Whatever the principled, economic or Constitutional arguments against the version of health-care reform sponsored by President Obama are, it must be understood that it has nothing to do with expanding health insurance coverage, and everything to do with the re-distribution of wealth. Why is that? Understanding the purpose of insurance, to protect ourselves against risk, expanding what the health insurance industry has become has nothing to do with risk. By forcing everyone to purchase insurance, the government is re-distributing wealth to insurance companies. By providing "insurance" through a public option, the government is re-distributing wealth from taxpayers to health-care consumers. And by making it illegal for health insurance companies to deny coverage based on pre-existing conditions, the government is re-distributing wealth from the healthy to the unhealthy. The Socialist (impossible) goal of the equal distribution of wealth is what is being sought. And because it has nothing to do with real insurance, the version of health-care reform sponsored by President Obama can only be a mechanism to re-distribute the wealth owned by everyone in America. Such is the (claimed) goal of Socialism, and such is the goal of socialists. You need to just go off and form your own country somewhere because you are so anti-american its pathetic.